You’ve seen these kinds of stories before. Chances are, you’ve seen them in a social media feed then started noticing links from “around the web” on sites you’ve visited. This has led to some interesting trends online. There’s good reason this is happening but a terrible trend in my opinion. Businesses publishing content online need to make money doing so. That’s where ads come in. The publishers spend considerable time and money attracting readers to their site then they need to engage you with more content, show you ads, and hope that you buy something or click from one of the ads they’ve sold. That’s how they make a living. There’s considerable science and automation which is put to task matching ads to the right “user”. That’s why you’ll often see ads for things you’ve browsed for or which you may actually be interested in. There’s also times when site ads actually come from other publishers who are willing to pay for someone else’s audience to come to their site. 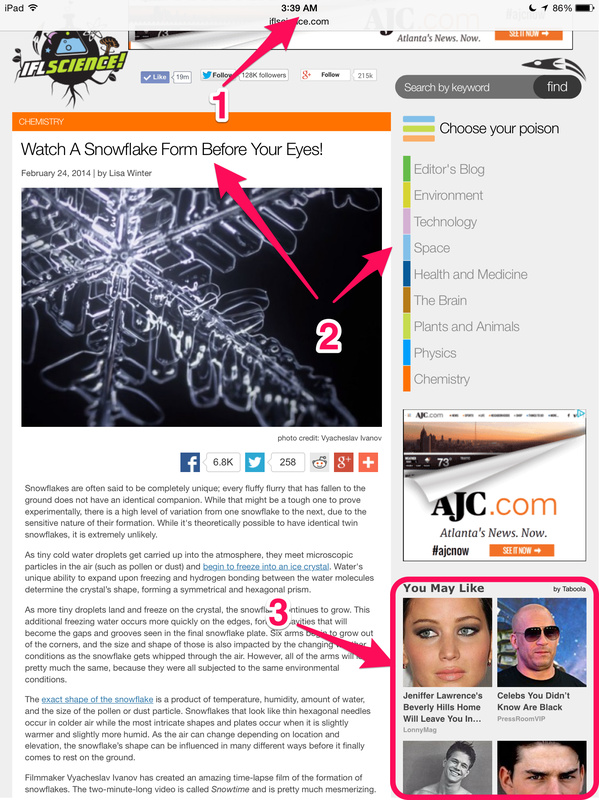 Often, you’ll see a block of links to stories on another site. That essentially means that Site A is selling their audience to Site B. When it’s done right, there’s a good match of content. Like this. This is how to respect your audience. Show them what they’ve come to you for. 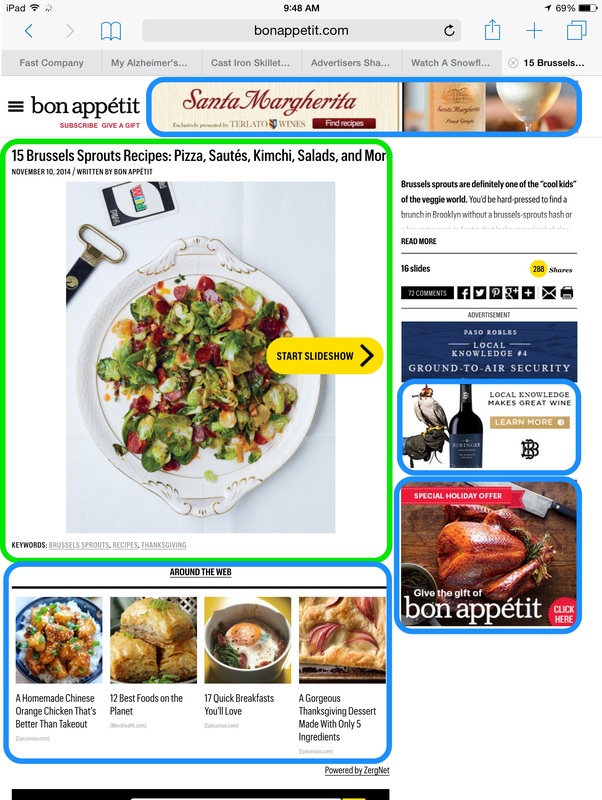 Here is an article on Bon Appétit which I’ve got marked in green. Everything in blue makes sense. It’s a food site and there are ads about… food! Note the ZergNet stories at the bottom. ZergNet’s providing a platform for companies like Epicurious and Men’s Health to pay to attract Bon Appétit’s audience. And Bon Appétit is willing to sell them and make money. It’s a trade that works for everyone. Where the problem comes in is when this is done wrong. When there’s no thought put towards matching an audience to content and that content is bad. Bad as in low-end tabloid bad. Let’s have a look at how that’s done. When the content doesn’t match the context. The first thing you’ll notice is that you should never pick up your iPad at 3:39 in the morning. The second thing you’ll notice is that instead of sleeping, I was going to watch an HD slow motion video of snowflake formation on IFL Science. ILFS is a pretty awesome site which I Liked on Facebook and who may have paid to put this link in my news feed. Notice that the site also has areas for physics, space, technology, health, and the like. More and more, any branded content you see on Facebook is paid for. This, of course, means that advertisers expect to get a return for their money. There’s an ad there from AJC.com and I live in Atlanta. That’s a pretty solid match. Now have a look at the red area #3. This is powered by Taboola much like Bon Appétit’s ZergNet section. The problem here is that the content in the ad area not only has nothing to do with what I was reading, it’s actually got nothing to do with me. Let’s scroll down some. This is where the paid content gets insulting. Green is good here. It’s more information from IFL Science which I might want to read and could keep me on the site. The blue area is advertising or calls to action which I’d expect to find. The red areas are nothing but unadulterated crap. I’m on a science site. Why on Earth would I want to read about dumb celebrities. Jennifer Lawrence is pretty awesome and I’m happy for her that she’s got a nice house. Tom Cruise has made a good number of movies I truly enjoyed (Minority Report, Edge of Tomorrow, Collateral, most of the Mission Impossible shows) and I’m thankful that he spent some money on his teeth though I can’t remember them looking anywhere near that bad in Risky Business. But these links are junk and don’t interest me in the slightest. 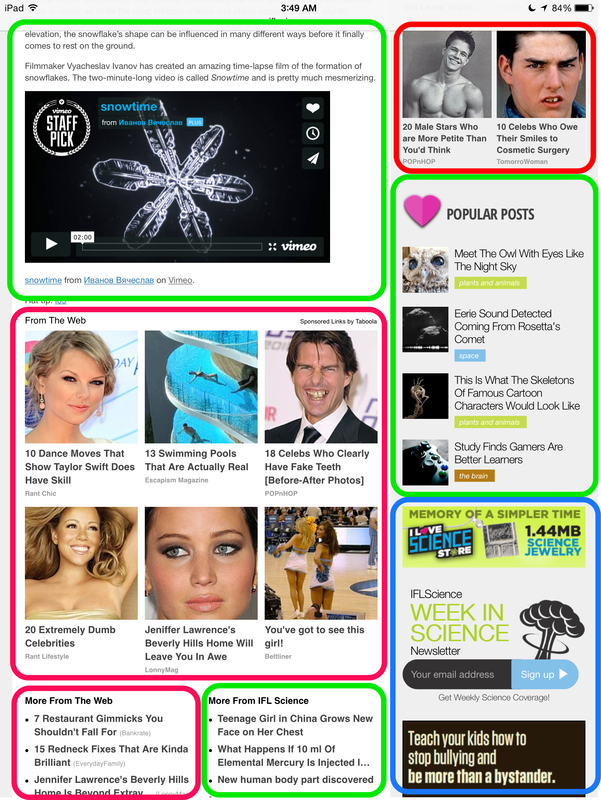 What’s actually insulting is that the tabloid content is more prominent than the science material – on a science site. It represents a dumbing down of the WWW to the lowest common denominator. Aside from any privacy concerns online, I’d rather see an experience which looks like some thought was put into it rather than have the sites I browse turn into the tabloid display at the grocery. I’m hopeful that this isn’t a trend which continues. To make it stop, don’t click on them. Stop clicking on link bait. You get the experience your actions pay for.